Robert Trowers was born in Brooklyn, New York. He developed an interest in the trombone from listening to the music of the "swing era." Among the bands that sparked his interest in jazz were those of Count Basie, Duke Ellington, Glenn Miller and Artie Shaw. Some of the trombonists that influenced his playing style were Lawrence Brown, "Tricky Sam" Nanton, Tyree Glenn, Tommy Dorsey, Glenn Miller and Jack Teagarden. Later, he became enamored of the "bebop" school of playing, particularly the work of J.J. Johnson, Jimmy Cleveland, Curtis Fuller and Frank Rosolino. During his college years, Mr. Trowers played in numerous professional-level bands in and around New York. He was a member of Jaki Byard's "Apollo Stompers" and the Ray Abrams / Hank Dougherty Big Band. He played with other New York jazzmen such as Charles Byrd, Ray Draper, Cecil Payne, Harold Cumberbatch and Mario Escalera. He did his first European tour as a member of Abdullah Ibrahim's band in 1979, called "Ujammah." This group began the tour with a Carnegie Hall appearance and ended with a concert at New York's Public Theatre. In 1982, Mr. Trowers got a call to play with jazz legend Lionel Hampton, and stayed for the next three and a half years. After a year freelancing in New York and teaching in the public school system, he did a European tour with another jazz legend, Illinois Jacquet. Shortly after this tour, he was hired to play trombone in the Count Basie Orchestra, under the direction of Frank Foster. He would stay in this band for the next eight years. The years with those stellar bands put him onstage with some of the greatest names in jazz, including Sarah Vaughn, Dizzy Gillespie, Billy Eckstine, Nancy Wilson, Ella Fitzgerald, Cab Calloway, Jay McShann, Sonny Stitt, Benny Carter, Al Grey, Frank Sinatra, Joe Williams, Tony Bennett and many others. During his hectic Basie years, Mr. Trowers recorded two albums under his own name for Concord Records; "Synopsis"(1983) and "Point of View" (1985). Critics described his sound as "vibrant and pointed," "smooth, warm and inviting" and "one of the best." 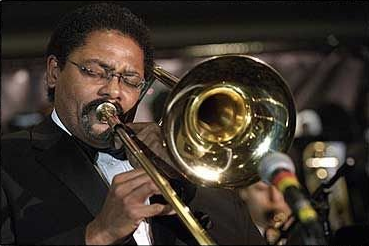 After the Basie years, Mr. Trowers toured with the Lincoln Center Jazz Orchestra under the direction of Wynton Marsalis and later with the Carnegie Hall Jazz Band under Jon Faddis. Notable freelancing activities include a short tour with T.S. Monk playing the music of his father, Thelonius Monk. Mr. Trowers also played at the Saratoga Jazz Festival with his own group and did a European tour with a traveling theatre production of the Broadway show "Black and Blue." In addition, Mr. Trowers (along with Basie band colleagues Derrick Gardner and Frank Foster) started a New York nonprofit arts organization named "Progressive Artistry." Progressive Artistry received numerous grants from the Brooklyn Arts Council, and presented numerous jazz concerts and lecture / demonstrations in inner - city neighborhoods up until 2004. In this period after the Basie years, Robert was also a member of the Vanguard Jazz Orchestra (originally known as the Thad Jones / Mel Lewis Orchestra), and played their traditional Monday nights at the Village Vanguard, also doing a short tour of France and Tunisia with them. This period also saw him as a member of one of the late editions of Frank Foster's “Loud Minority” big band. Robert is currently on the faculty of North Carolina Central University (NCCU), in the Jazz Studies program. NCCU boasts an award-winning jazz faculty and a jazz band that has consistently had a high percentage of its members in the H.B.C.U. all -star band in its years of participation. He is also the current trombonist in Randy Weston's African Rhythms Quintet.